ART UTE is a proposal to support a community of artists over time. ART UTE is a 1991 Toyota Hilux utility vehicle, a custom set of personalised registration plates and a conceptual ideology, that when combined, supports the making and exhibition of art projects through the provision of ART UTE to artists by its owner. For Temporary Mechanisms ART UTE acts as a collaborative project for which Monteith invited artists to install artworks as a response to the context of the ART UTE projects. Displayed at the front of the gallery the matt black, lowered Ute acts as a mobile social art project. In a second aspect of the ART UTE initiative sound artists were invited to contribute audio works to be played in the cab via the trucks sound systems. John Ward Knox (26.02.13 - 04.03.13), Sarah Munro (04.03.13 - 11.03.13) and Judy Darragh’s MUSCLE (11.03.13 - 16.03.13). Rachael Shearer, Sean Kerr, D.A.N.C.E Art Club, Clinton Watkins and Linda T. Collaborator information here. ART UTE is an on-going project that proposes mobile and collec­tive models of art and exhibition practice. 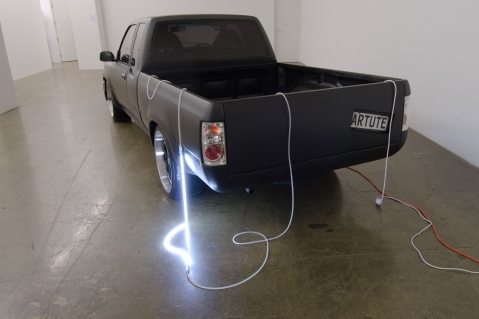 The project proposes the ute be used in either the production of art (transport for artists to move materials around) or the exhibition of art using the space provided by the ute itself; the tray and cab. ART UTE values are speed, mobility, play and collectivity. Future curatorial decisions in relation to how ART UTE might support the art community could consider implications of these ideas, though not be unduly bound by them. ART UTE’s main consideration is in the continued variation and possibilities for art that improvise and extend the spaces in which art might occur or be read. ART UTE’s legal standing as a vehicle for use on Aotearoa’s roadways means it can easily survive closures of architectural exhibition space in tough times. ART UTE is not allergic to institutional space where an artist shows an interest in engaging gallery or museum associated spaces.